Unable to find a suitable macaron in Boston after studying abroad in Paris as an undergrad, Kinesha Goldson founded Cameo Macaron, a food truck that sells the delicate French confections. Kinesha Goldson is, quite literally, in the pink of things. 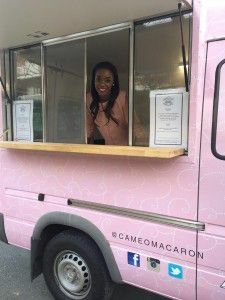 As the founder of Cameo Macaron, Goldson is making her mark in the food truck industry with her 1,300-person social media following and brand new glamorous pink truck. Clearly she is hard to miss, and once you try one of her macarons, you’ll be glad you didn’t. At Northeastern University, Goldson switched from a criminal justice major to a communication major and attended her first courses in Paris as part of a study abroad program. In Paris, she lived by herself in a tiny studio apartment in the seventh arrondissement (or administrative district) within walking distance from the famous macaron shop Ladurée on the Champs-Élysées. She quickly welcomed the treat as part of her Saturday routine. Back from Paris, Goldson graduated and became a retail buyer for Talbots. But her hunt for a local version of the perfect macaron never stopped until Goldson finally decided to take matters into her own hands and established Cameo Macaron in the summer of 2013. In order to get there, Goldson first had to quit her job as a buyer and learn the ins and outs of the food business. Leaving a paying job was a big risk, Goldson said. Goldson looked to get smart fast about the food truck business. She gained on-the-job-training on Boston’s Renula’s Greek Kitchen food truck. Here she learned the art of customer service and basic food truck business 101. “I am just putting myself out there. I want people to see what I do and say, ‘That girl is on top of her stuff,’” Goldson said. With a little hands-on experience under her belt, there were still plenty of details to sort out. There was the purchase of the food truck, sourcing ingredients, securing licensing and marketing the concept. Then came the moment of truth. The price tag to make it all happen: $60,000. “I wanted to cry,” she said. Yet she wasn’t about to let that number get in her way. And that she did with the support of her family, friends and work partners along with her very own business and communication skills. Plus, Goldson was able to turn that daunting $60,000 cost projection into a much more financially manageable one. “When I decided I was going to quit my job, my boyfriend reminded me that everything I’ve ever wanted to do, I’ve done. And once I bought this truck, there was really no going back,” she said. Good thing, because Cameo Macaron seems to be a blossoming success. Goldson’s calendar is booked with weddings, baptisms and some well-placed popup events. She’s even had time to give back: This past December, Goldson held an event at the French Cultural Center where she donated her macarons to the annual Children’s Christmas party. The future for Cameo Macaron looks extremely bright. Goldson, a consummate planner, already has big plans for Cameo Macaron’s next steps. Before that happens though, Goldson hopes to expand to another food truck and get her name out even more — maybe even start a delivery service. 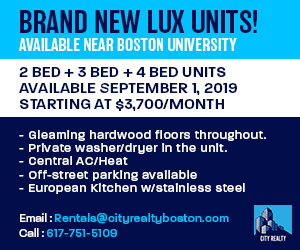 One thing that Goldson knows for sure, however, is that she will not be leaving Boston, which is a relief because it’s clear that, after one sample of her delicious macarons, we need her to stay close by. And, with spring on the way, it will only be a few weeks until Goldson and her beautiful pink Cameo Macaron truck will be back roaming the streets of Boston. Very interesting, I look forward to having a few of these macaroons. I wish you good luck and will be on the look out for your pink truck.